My office is in chaos – again. After finishing my course thesis on the parallels between Ralph Ellison’s Invisible Man and Dostoevsky’s Notes from Underground last month, I spent a Saturday clearing the disarray of books, critical essays, notepads and Post-its with my jotted thoughts and references, my highlighted and dog-eared MLA Handbook and dictionary, half-empty water bottles, bags of kale chips and chocolate covered almonds, and uncapped pens and highlighters scattered on the desk and floor of my den. For weeks this project had consumed me as I worked to create an organized, meaningful, well-written essay from a jumble of notes and fragmented ideas by the midnight deadline. Three weeks later the clutter is back, as I now work to meet the deadlines for several guest blog spots, a newspaper column, and my MFA thesis. I’m familiar with the muddle of my surroundings and in my mind and am oddly calmed by it. Scribbles on scraps of paper, napkins, envelopes, receipts, sticky notes, and index cards are once again ubiquitous, tacked to my bulletin board and adhered to my computer monitors, reminding me to add a transition, description, or a bit of dialogue to some work-in-progress. Books, writing magazines, and drafts of my columns, stories, essays, and novel chapters, defaced with nearly illegible edits and suggestions (mine and others’), litter the floor in shambolic piles that seem incongruous with my reputed compulsion toward extreme tidiness. It appears this is how I create. Even without the looming deadlines, disorder is part of my process. While writing my Bakhtinian analysis of The Picture of Dorian Gray a few years ago, I learned that the crude journals in which Mikhail Bakhtin had written one of his most influential manuscripts were lost for nearly seventy years, buried in a lumber room where rats and seeping water had severely damaged much of them. About what could be discerned, Michael Holquist says this: “In the faded scrawl we can see the race between the occurrence of ideas and their feverish transcription. This volume provides a chance to see Bakhtin in all the heat and urgency of thought as it wrestles with itself. In Toward a Philosophy of the Act we catch Bakhtin in the act – the act of creation” (ix). 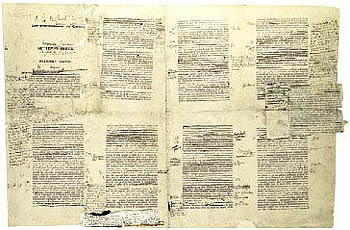 An 1890 typescript of Dorian Gray with Wilde’s corrections and emendations reflects a similar, seemingly haphazard approach to the process. Words and even entire sections are crossed out or rewritten, and handwritten insertions run between the typed lines and up the margins. Nearly indecipherable notes and corrections to himself and to his typist fill the white space of each page of what we know is not even an early draft of the narrative. A characteristically organized person, the chaos of my own comparatively tiny writing life vexes me. Over the years, I’ve created paper and computer files and designated bins to contain my various projects, but, once immersed in the work, the system seems to fall apart. And no matter how many journals I purchase, the ideas and insights continue to be recorded on the nearest scrap. The act of creation, it would seem, is simply messy. Published on TreeHouse: An Exhibition of the Arts on June 12, 2013.